Do you love rustic copper designs? 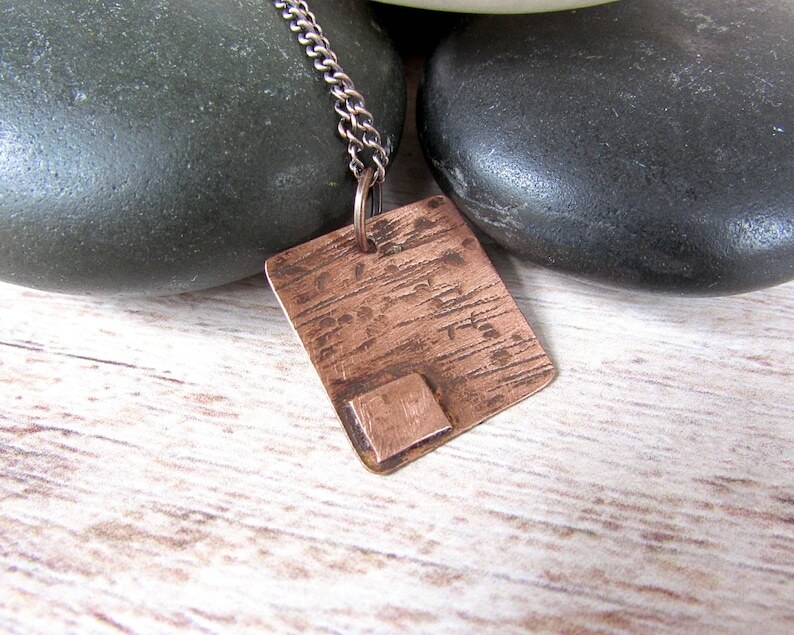 Then this copper square copper on copper pendant is perfect for you. Want a piece that is easily layered with other pieces or is gender neutral? Then grab this one of a kind pendant. Carefully hand-cut from pure copper, this pendant has textured to resemble the bark surface of a Birch tree. A small rectangle of smooth copper has been expertly soldered (using Lead, Nickel and Cadmium free solder) to the textured surface to add contrast. All edges have been filed and smoothed to ensure a comfortable wear. The large rustic jump ring allows for thin oxidized copper chain to glide through. The chain has been finished with matching jump rings and lobster claw clasp. This pendant has been has been quadruple sealed using acrylic shellac to prevent tarnish. This process will only slow down the natural patina process of the copper. As copper ages, the color changes due to the natural oxidation process of the metal. It is in no way a flaw or defect. If this is an undesired change, simply strip the shellac off using an acetone based nail polish remover and polish the metal. Re-seal the metal using clear fingernail polish or other metal sealer. The pendant measures approximately 1 inches x 1 inches (2.54 cm x 2.54 cm) across.